“Murder Takes Time” by Giacomo Giammatteo is nothing short of intense. Giammatteo takes many complex story lines and wraps them into a tight literary package. In an immigrant neighborhood of mostly Italians in Wilmington, Delaware, Frankie “Bugs” Donovan, Nicky “the Rat” Fusco and Tony “the Brain” Sunnullo are three little boys who get into whatever may come. When Nicky’s mother dies, Tony and Nicky become more than just friends when Tony’s mother helps Nicky’s father by taking Nicky into her home and raising him like he’s her own child. Their old neighborhood is full of adventure, and these childhood friends often find more trouble than they can handle. Just like any young crew of roving boys, they live to see another day and get into new predicaments. They begin running small errands for the mob figures in the neighborhood, which is how they earn their nicknames. One night, the mobsters are hanging out at a card game, and the boys are challenged to kill a bunch of roaches thrown across the floor. Whoever kills the most roaches wins the money being offered as a prize. Frankie’s experience with quickly killing roaches in his own house gave him the advantage. From that point on, Frankie became now known as “Bugs” Donovan. Tony acquired the nickname “the Brain” because of the high level of intelligence he displayed in Catholic school. With age comes a deeper bond between the three friends. They use money gained from their various capers to rent a rundown garage to use as their private hangout. They even allow Tommy McDermott, an Irish boy, to come into the folds of their otherwise Italian brotherhood and nickname him “Mick”. Most importantly, they take on a code: “Friendship and Honor”. There are two basic rules to their creed: 1) They stay loyal to each other no matter what. 2) No one from the outside messes with anyone in their clique without messing with everyone in their clique. One fateful night, the boys fight another gang of boys for disrespecting one of Frankie’s sisters. Fists are thrown. Guns are drawn. Mick and a boy from the rival gang get shot in the fray. When the smoke clears, Mick is dying, and Frankie decides to run with Tony. Nicky abides by the codes of “Friendship and Honor” and refuses to leave his dying friend. No one takes that oath more seriously than Nicky “the Rat,” and no one is more negatively affected by following that code than him. His adherence to the code gets him seven years in prison. From that situation, “Murder Takes Time” unravels in a myriad of ways. Going forward in time, the lives of Frankie, Nicky and Tony take divergent paths. Frankie enters into law enforcement and is a lead detective in Brooklyn, NY, investigating a string of murders of men with ties to the influential Martelli mob family. The killer that Frankie is tracking down is methodical, sadistic and has an enigmatic motive. What’s worse, Frankie has a sinking suspicion that the killer is purposefully leaving clues for him. Nicky “the Rat” exits prison as a pure killing machine. He has disciplined his body and mind, but his spirit is still restless. His childhood friend and personal rival Tony “the Brain” Sunnullo has risen in the ranks of the mob to become a crew boss. Tony connects Nicky with his boss, Tito Martelli. Because of the connection between Nicky and Tito, the lives of Nicky, Tony and Frankie become intertwined in ways that they could never have fathomed as little boys running around their Wilmington neighborhood. 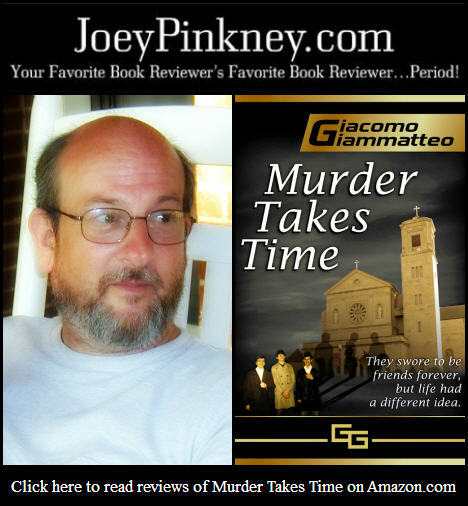 I found Giacomo Giammatteo’s approach to “Murder Takes Time” very interesting. The book covers several decades and effectively uses both first-person and third-person perspectives to get the reader hooked into the storyline. The story continually vacillates between the past and the present. Giammatteo constructed the plot of “Murder Takes Time” so that the past provides critical information that feeds scenes from the present—and vice versa. Nicky “the Rat” Fusco’s perspective is told in first person while the narrator follows the other characters (mostly Frankie) and tells their story in the third person. The women in this novel have more than marginal roles in the storyline. Mamma Rosa is a matriarch of sorts in the old neighborhood, and she is the mother of Tony “The Brain” and mother-figure to Nicky “the Rat.” Mamma Rosa makes no distinctions between Tony and Nicky. Just like biological siblings, the two are jealous of each other’s relationship with Mamma Rosa, and her indelible wisdom endures throughout their lives long after Mamma Rosa has passed away. Then there’s Angie, a girl whose mother dies and she inherits the responsibility of cooking for her father. Mamma Rosa takes Angie under her wing and teaches Angie the ways of Italian cooking. Angie becomes a point of contention between Nicky and Tony in unimaginable ways as “Murder Takes Time” progresses. A third woman who adds a lot of flavor to “Murder Takes Time” is Sister Mary Thomas. What is an Italian neighborhood without a strong, Catholic influence? Sister Mary is the quintessential disciplinarian, demanding respect and offering wisdom to Nicky, regardless of his personal and professional struggles. Her tough love runs deeper than Nicky initially knows. Along with Mamma Rosa and Angie, Sister Mary pushes the story forward in ways that the guns and tough talk could never do. As the time shifts from past to present, and the perspective shifts from Nicky to Frankie and also to that of other characters, this multifaceted story unfurls and curls in ways that enlighten you and keep you on your toes. This approach to storytelling will confirm some of your hunches while keeping you in suspense about others. This was an excellent and efficient way of telling a grand story in the number of words/pages Giammatteo allotted. “Murder Takes Time” by Giacomo Giammatteo is a classic good-vs-bad tale sculpted by an outrageously creative writer. It tests the boundaries of the “Friendship and Honor” oath Frankie, Nicky and Tony take as boys and how that affects them as men whose lives have taken different paths. This novel keeps you turning the pages, because you become deeply and emotionally invested in each of the characters and how their decisions have lifelong implications. Joey: Thanks for such a detailed and wonderful review. Your reviews equal your interviews in professionalism. I’m glad you enjoyed the book, and I appreciate you posting it. You are very welcome. What a wonder tale, told in a myriad of ways. If this is your debut, I can only imagine the growth of the next books in this series. I thought the review was excellent and shows that there are actually a few good sites who actually care enough to give an extremely impartial analytical breakdown of an author’s book without being biased. I look forward to reading this author’s work and as an author myself am looking forward to having my book reviewed by Joey Pinckney in the near future.